The Hudson River Chain was two chain booms and two chevaux de frise constructed from 1776 to 1778 during the American Revolutionary War across the Hudson River as defenses to prevent British naval vessels from sailing upriver. These defenses along the Hudson River were overseen by the Highlands Department of the Continental Army. The most significant and successful was the Great Chain, constructed from West Point in 1778, and used through 1782 after the war's end. The huge links for the chains were forged at iron works in Orange County, New York. Both the Americans and British knew that passage on the Hudson River was strategically important to the war effort. Americans worked to devise plans to slow or block ship passage on the river, planning to attack enemy ships by cannons and mortar located at existing defensive forts or those to be constructed. In late 1776 Henry Wisner, a resident of Goshen, New York and one of New York's representatives to the Continental Congress, along with Gilbert Livingston, sounded the Hudson River and, as part of a Secret Committee of the "Committee of Safety," recommended the placement of chains in strategic locations along the Hudson. The Americans eventually constructed such obstacles across the river at northern Manhattan, between forts Washington and Lee in 1776; at the newly constructed Fort Montgomery on the West Bank on Popolopen Creek in 1776–1777 south of West Point; a partially completed one at Pollepel Island in 1776–1777 north of West Point; and the Great Chain (1778–1782) between West Point and Constitution Island. The largest and most important project was the last-mentioned chain, at West Point, which was reset each spring until the end of the war. Attention was concentrated on the West Point area because the river narrowed there, and curved so sharply that, together with winds, tides and current, ships already had to slow to navigate the passage. Creating more obstructions on the river enabled the shore batteries to work their cannons against the enemy. As part of the barriers erected across the river, the Army constructed chevaux-de-frise, an array of logs sunk underwater, between Fort Washington on the island of Manhattan, and Fort Lee across the river in New Jersey. The logs were intended to pierce and sink any British ships that passed over it. An opening was left for the passage of American ships. After the British learned of the opening from a local resident, they successfully passed through the barrier several times. The British captured Fort Washington on November 16, 1776 and Fort Lee on November 20, rendering the defensive barrier moot. A chain and boom were stretched across the river from Fort Montgomery on the West Bank, at the lower entrance to the Highlands just north of the modern-day Bear Mountain Bridge, to Anthony's Nose on the East Bank. Fort Clinton had been built just south of Popolopen's Kill (or Popolopen Creek) and also on the West Bank. Captain Machin headed this effort. In November 1776, a faulty link broke under stress induced by the river tides, highlighting some of the difficulties of trying to chain the Hudson. It was repaired and reset. After the British captured forts Montgomery and Clinton on October 6, 1777, they dismantled the chain  and raided upriver as far as Kingston. Governor Clinton, one of the committee assigned by the New York Convention to devise means of defending the Hudson, was heartened as the British never attempted to run ships through the chain. He concluded that the basic idea of obstructing the river seemed sound. 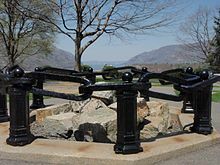 After Captain Machin recovered from wounds from battle with the British, he began work on the stronger Great Chain at West Point, which was constructed and installed in 1778. Another chevaux-de-frise was constructed across the Hudson between Plum Point and Pollepel Island, north of West Point. The defenses were never fully completed, and its importance was overshadowed by completion of the Great Chain at West Point the following year. "Fields of Fire", from Fort Constitution on the Hudson River during the American Revolutionary War. In the spring of 1778, a heavy chain supported by huge logs was stretched across the Hudson from West Point to Constitution Island, opposite. It was constructed at the Stirling Iron Works, in Warwick, Orange County, and chain links from Long Pond Iron Works in Ringwood, New Jersey. The task was completed in six weeks. The Hudson River's narrow width and sharp turns at West Point created adverse sailing conditions. The Army took advantage of this by constructing The Great Chain in 1778 as an obstacle to the movement of British ships north of West Point. The distinctive "S-Curve" of the Hudson at this point forced any large ship to tack in order to navigate it. American soldiers positioned the chain to impede the progress of a ship should it attempt to turn into the east-west channel against the strong current and frequently unfavorable winds. Part of the estuary of the Lower Hudson River, this area is subject to significant tides, making navigation by sailing vessels particularly difficult. Cannons were placed in forts and artillery batteries on both sides of the river to destroy ships when they slowed to a halt against the obstacle. When finally completed, the 600 yards (550 m) chain contained huge iron links, each two feet in length and weighing 114 pounds (52 kg). The links were carted to New Windsor, where they were put together, and floated down the river to West Point on logs late in April. Including swivels, clevises, and anchors, the chain weighed 65 tons. For buoyancy, 40-foot (12 m) logs were cut into 16-foot (4.9 m) sections, waterproofed, and joined by fours into rafts fastened with 12-foot (3.7 m) timbers. Short sections of chain (10 links, a swivel, and a clevis) were stapled across each raft and later, in the river, the chain sections were united. Peter Townsend, owner of Sterling Iron Works, was paid by the Continental Congress to manufacture the chain. Captain Thomas Machin, the Artillery Officer and engineer who had installed the chain at Fort Montgomery, was assigned to the same task at West Point. On 30 April 1778, he directed the installation of the chain across the river. Its southern end was secured to a small cove on the West Bank of the river and its northern end was anchored to Constitution Island. The West Point side was protected by Chain Battery and the Constitution Island side by Marine Battery. Both ends were anchored to log cribs filled with rocks. A system of pulleys, rollers, ropes, and mid-stream anchors were used to adjust the chain's tension to overcome the effects of river current and changing tide. Until 1783, the chain was removed each winter and reinstalled each spring to avoid destruction by ice. A log "boom" (resembling a ladder in construction) was built to span the river about 100 yards (91 m) downstream (south of the chain) to absorb the impact of any ship attempting to penetrate the barrier. After the revolution, the portion of the chain not saved was "relegated to the West Point Foundry furnaces near Cold Spring, New York, to be melted down for other uses." The saved chain portion was first displayed at the West Point ordnance compound, along with a captured mortar, as shown in the black and white drawing to the right, which was made in 1905. More recently, it has been displayed at Trophy Point, where the chain surrounds a pile of rocks. The thirteen links of the chain represent each of the original states; the display includes one swivel and one clevis. The exhibit is maintained and preserved by the West Point Museum. Recovered in 1855 from the river, a section of the boom is displayed at Washington's Headquarters State Historic Site in Newburgh, New York. Capitalizing on pride in the audacious engineering project, John C. Abbey, and later Francis Bannerman, sold counterfeit chain links to collectors and museums. "Hudson River Chain", Harper's Encyclopedia of United States History, Vol. IV, p. 447, Harper & Brothers Publishers, 1905. Information plaques at Trophy Point at West Point, New York. ^ Letter from Henry Wisner and Gilbert Livingston to New-York Committee of Safety: Soundings of Hudson river in the Highlands American Archives Series 5, Volume 3, Page 0812 November 22, 1776. http://lincoln.lib.niu.edu/cgi-bin/amarch/getdoc.pl?/var/lib/philologic/databases/amarch/.27283 Archived 2014-12-04 at the Wayback Machine Accessed February 19, 2015. ^ "USMA: West Point Museum". Retrieved 2010-11-07. Wikimedia Commons has media related to Great Chain, West Point. This page was last edited on 12 December 2018, at 22:30 (UTC).